Home Alone's Kevin and Wet Bandits Marv and Harry! 8-inch action figures dressed in tailored fabric clothing. Featuring interchangeable heads and cool accessories! When Kevin's family left on their European vacation, they forgot one little detail: Kevin. 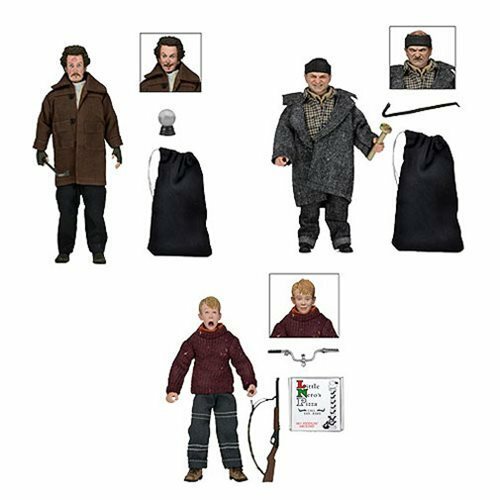 Celebrate the classic Home Alone movie with this retro Home Alone 8-Inch Retro Action Figure Set that includes Kevin and would-be burglars, the Wet Bandits, Marv and Harry. They all come dressed in tailored fabric clothing similar to the iconic toy lines of the 1970s, and each figure features interchangeable heads sculpted in the actor's likeness, as well as plenty of accessories. Kevin comes with alternate hands, a BB gun, zip-line handlebars, and a Little Nero's pizza box; Harry includes a kaleidoscope, crowbar, and drawstring burglar sack; and Marv brings a snow globe, crowbar, and drawstring burglar sack. Ages 14 and up.